This building located at 4401 Connecticut Avenue, NW will be the new home for WAMU 88.5, American University Radio. American University has signed a contract to purchase a building to become the new home for WAMU 88.5, the public radio news and information station licensed to American University. 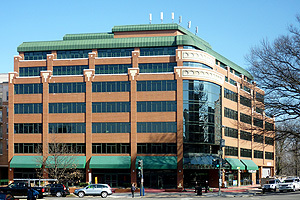 The seven-story building, located at 4401 Connecticut Ave., NW, has 96,102 gross square feet. As the anchor program in the building, WAMU 88.5 and its music service, WAMU’s Bluegrass Country, will occupy more than half of the space to fit its current needs, with the potential for future expansion. AU has conducted its due diligence for the property, and the purchase completion is targeted for this spring. Since the building is largely vacant, AU architects are working with station management to implement a rapid design-build process with the goal of WAMU 88.5 broadcasting from its new home in the first quarter of 2013. The remaining space will be utilized for other university academic and administrative purposes. The new home is approximately one mile from the station’s current Tenleytown location and is easily accessible from the Van Ness Metro. The site matches the essential criteria for current and future station space needs, as identified through a process initiated by WAMU 88.5 in conjunction with American University. In addition to offering WAMU 88.5 more than twice its current operating space, the site offers first floor, street-level visibility, underground parking, and expansion capability to meet future station needs. The renovation will transform and outfit the space as a world class broadcast facility, with a future fundraising effort to be launched to support the project. "I'm delighted that WAMU is to fill that space and bring the station to Connecticut Avenue—a vibrant Ward 3 corridor. I trust the station will become even more involved with the community and provide opportunities to see and experience radio operations close up," said Mary Cheh, Ward 3 councilmember. WAMU 88.5 is currently housed in 23,000 gross square feet at 4000 Brandywine St., NW, which has been the station’s home since 1993. Nineteen years ago, the public radio station was a single channel FM station with a $4.1 million budget and 60 full and part time staff. Currently, WAMU 88.5 is a $21 million multi-platform operation with more than 120 employees broadcasting in Washington on three HD Radio channels—the flagship frequency at 88.5-1; WAMU’s Bluegrass Country, a bluegrass and American roots music station, at 105.5 FM and 88.5-2; and Intersection at 88.5-3, a news and information station broadcasting international coverage from the BBC and public radio programs unavailable elsewhere in the Washington area. The station also broadcasts from 88.3 FM Ocean City on the Delmarva Peninsula. WAMU 88.5 has close to 750,000 listeners in the greater Washington, D.C., area. Its network of websites, including wamu.org and drshow.org, hosts more than 350,000 visitors a month. WAMU 88.5 ranks among the top five stations in the Washington market and the top three public stations nationally. The station is the home of The Diane Rehm Show, distributed nationally by NPR to more than 160 NPR member stations and more than 70 HD Radio channels nationwide, and heard by overseas listeners through NPR Worldwide, the Armed Forces Network, and Sirius XM Radio. The Diane Rehm Show now reaches an audience of more than 2.3 million listeners weekly. In 2010, Diane Rehm was awarded the prestigious Peabody award for her achievements in broadcasting. WAMU 88.5’s local shows, The Kojo Nnamdi Show and Metro Connection, have won numerous awards and are go-to sources for news and information about local politics, personalities, arts, and culture. The station’s award-winning local news team has grown substantially over the past five years and provides breaking news and in-depth coverage of the District, northern Virginia, and Maryland, as well as education, politics, and the environment. Last October, the station hosted a 50th anniversary celebration recognizing the achievements made since signing on in 1961 and honoring the station’s founders who played pivotal roles in its history, including original employee Susan Stamberg and Washington broadcasting legends Diane Rehm, Fred Fiske, and Ed Walker.